I love ANTHOLOGIES. A literary anthology is a collection of stories or poems by different authors, but usually sharing a theme or genre. Horror Stories is a film anthology containing four stories and a frame story all directed by different South Korean directors. It’s by far NOT a new concept. One film already written about in this blog is an excellent example of a film anthology: Dead of Night. One of my favorite anthology films growing up was Stephen King’s Creepshow. Great stuff. Horror Stories doesn’t serve up much that’s original, but it does have its appeal. 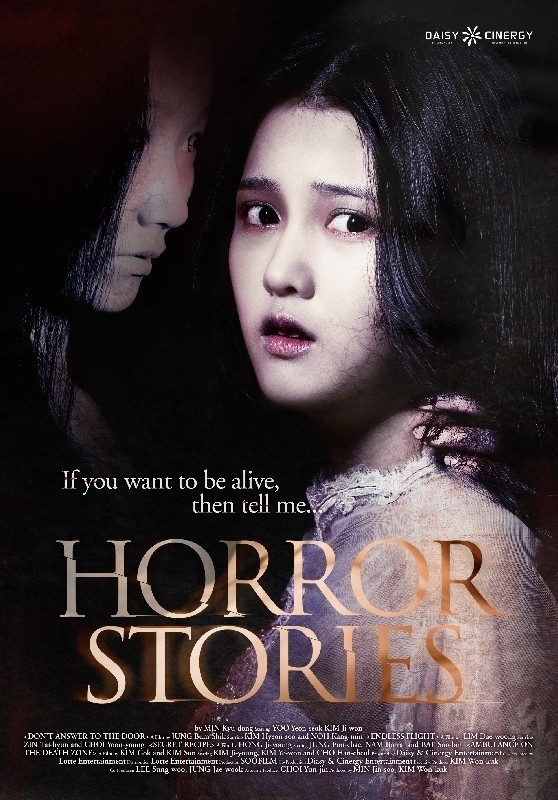 It was popular enough in South Korea to spawn a sequel with the amazingly unoriginal title: Horror Stories 2. It relies too much on the dream scare or the dream within a dream to allow it to go to dark places and show whatever it can to scare us, then lamely back out as in, “Oh, that was just a dream.” Very lame story telling. But the acting is good and the collection is a good selection of shorts that encompass several sub-genres. Hostage with her handsome psycho kidnapper. Beginning: Hostage narrative that frames the other stories and sets up a very Scheherazade style setting. A kidnapper, psycho guy (very handsome) has a girl hostage and forces her to tell him scary stories so he can sleep. I know, kind of lame. The short films that follow are the stories this girl tells her captor so he can sleep. Home alone with ghosts and crazy people. 2. “Don’t Open the Door” is a cross between a home invasion/child endangerment/ghost story. Kind of creepy, but ultimately not resolved very well. I still don't understand why a killer kills the pilots of the plane he's flying on. Guess that's why he's psycho! 3. “Endless Flight” was my favorite. It’s a terror at 30,000 feet genre. I love the highly unlikely scenario of a serial killer being transported to Seoul on a plane where one of his victims was a flight attendant that was supposed to be on that plane. The best thing about this one is it shows that even psycho serial killers can be afraid of ghosts! And for good reasons. Making plastic surgery scary is a Korean girl's worst nightmare. 4. "Secret Recipe” is kind of an homage to another short film in another anthology collection called 3 Extremes titled “Dumplings”. It’s a Bluebeard-meets-Hannibal-Lecter-with-Cinderella’s-step-mother kind of story based on a Korean folk tale of two sisters. One nurse against a viral zombie epidemic! you go girl! 5. “Ambulance on the Death Zone” is the final installment, and it’s totally an apocalypse end of the world zombie virus flick. Throw in a cautionary tale about how Korean mothers will seriously do anything for their children and that sums this one up. The production values are good and this one is definitely worth a watch, but again, unless you’ve got the lights out, don’t bother. The real scares in this one are very culturally Korean based. Such as psycho cannibal plastic surgeon doctors, serial killers who drive taxis, handsome models turned actors that play psychos. This one is definitely intended to scare the Korean female population more than the male, and its cruelty to women is unrelenting, but that’s common in a genre that has exploited females almost since its inception. At least the female in “Endless Flight” fights back! Can you guess what kind of stories this movie collects?